"Too Original To Garner Even Moderate Mass Appeal"
"Too Brilliant To Remain Buried In The Underground"
"Great Work, Ever Thought Of Trying It In Calypso?" "Acidly Ironic Even In Its Still Rising Utopianism." "hits you hard, and leaves your head spinning. 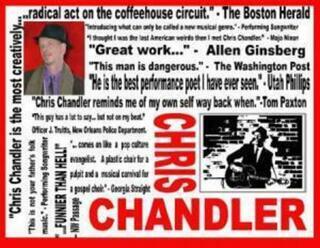 Chandler possesses a remarkably fertile and inventive mind..."
- Rich Warren for Sing Out! "Chris Chandler is the best performance poet I have ever seen."